1/25 The College Sporting News Feature on Jamie Savage. 1/24 Cobbers Lose 2-1 Nailbiter to St. Thomas. (Moorhead, Minn.)-- Concordia allowed a pair of goals 2:48 apart in the first period and lost a nailbiting, 2-1 game to league-leading St. Thomas. 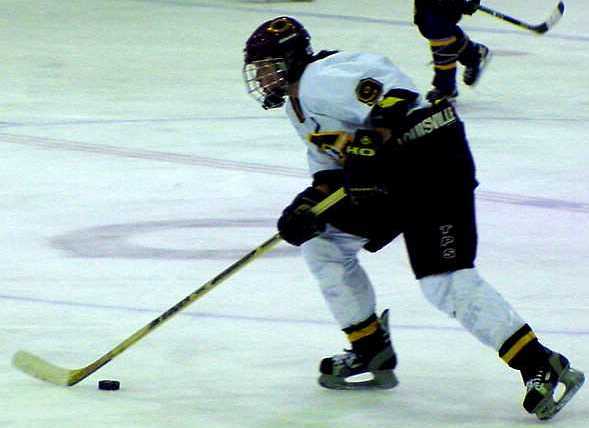 The Cobbers were able to cut the deficit to a single goal just 38 seconds later, but then the two teams played scoreless hockey for the remainder of the game and Concordia was saddled with their fourth straight loss. The Cobbers, who have not won at home this season, fall to 2-6-0 in the MIAC and 3-7-0 overall. St. Thomas remains perfect in conference play, winning for the 10th straight time. The Tommies also improved their overall mark to 12-4-0, they have now won four straight games. Tanaya Reitz opened the scoring for St. Thomas when she scored her fifth goal of the season at 12:22. The score was the lone power play tally in the game for either team. Michelle Radzik pushed the lead to two goals when she netted her first goal of the season at 15:10. The Cobbers wasted little time in cutting the deficit back to a single goal, as Lindsay Czarnecki (Jr., Riverside, Cali./Riverside-Poly HS) beat Tommie goaltender Becky Kilpatrick just 38 seconds later at 15:48. The goal was Czarnecki's team-leading eighth of the season, and snapped a 138-minute scoreless string for the Cobbers. Neither team was able to find the net for the final two periods as both Kilpatrick, and Cobber goalie Jamie Savage (Apple Valley, Minn./Rosemount HS), kept the opposing team off the scoreboard. Kilpatrick finished the game with 20 saves, and Savage turned aside 34 shots in the losing effort. St. Thomas outshot the Cobbers 36-21 in the game. Concordia will play at St. Ben's on Friday, January 30 at 7:00pm and Saturday, January 31 at 2:00pm. Both games will be played at the St. Cloud Municipal Athletic Complex. 1/23 Cobbers Can't Contain League-Leading St. Thomas for Full 60 Minutes, Fall 6-0. (Moorhead, Minn.)-- For 39:44, the Concordia women's hockey team held league-leading, and undefeated, St. Thomas to only one goal. Unfortunately for the Cobbers there was still 20:16 left to play in the game. The Tommies struck for a single goal to finish the second period, and then put in four more in the third period to come away with the 6-0 win. With the loss, Concordia falls to 2-5-0 in the MIAC and 3-6-0 overall. St. Thomas stays perfect in league play, upping their mark to 9-0. They are currently 11-4-1 overall. The Tommies scored the lone goal of the first period. Sue Heinmiller scored the first of her two goals at the 6:47 mark to give St. Thomas a 1-0 lead after one period. The teams were almost deadlocked in shots on goal for the first 20 minutes, with the Tommies holding a 9-7 advantage. The second period played out the same as the first, with the Tommies controlling the play and Concordia trying to counter. St. Thomas had the upper hand in scoring chances, and was finally able to beat Cobber goaltender Jenna Johnson (So., Wadena, Minn./Wadena-Deer Creek HS) with only 15 seconds left in the period. The game did not get away from the Cobbers until midway through the final frame. The Tommies collected a third goal at 7:05, and then St. Thomas put the game out of reach. With a player in the penalty box, the Tommies scored two shorthanded goals in the span of 24 seconds midway through the period. Heinmiller scored her second goal of the game at 10:12 and then Allison Turgeon countered with a goal at 10:36. Both goals were unassisted. Maureen Hardwick, St. Thomas' leading scorer, finished off the scoring by netting her fifth goal of the year at 17:59. Lindsay Czarnecki (Jr., Riverside, Cali./Riverside-Poly HS) led the Cobber offense with four shots on goal. The Tommies ended the game by outshooting Concordia 38-13. Johnson finished the game with 32 saves, while St. Thomas netminder Katie Jetland stopped 13 shots to pick up her first collegiate shutout. The two teams will finish the series tomorrow afternoon at 2:00pm at the Moorhead Sports Center. Concordia will then play at St. Ben's in a weekend series on January 30-31. 1/10 Cobbers Struggle Again in 4-0 Loss to Wildcats. 1/9 Cobbers Can't Shake Off Month of Rust, Fall to St. Kate's 3-1. 12/13 Cobbers Beat Michigan State 4-2. 12/06 Cobbers Hammer Hamline 6-1 to Complete Weekend Sweep. 12/05 Cobbers Roll Past Hamline 6-1. 11/29 Cobbers Have Tables Turned and Lose 4-3 to Lake Forest (IL). 11/29 Cobbers Edge Lake Forest (IL) to Pick Up First Win of the Year. 11/23 Cobber Can't Find Net, Lose to St. Mary's 3-0. 11/22 Cobbers Fall to St. Mary's 2-1 in MIAC Opener. 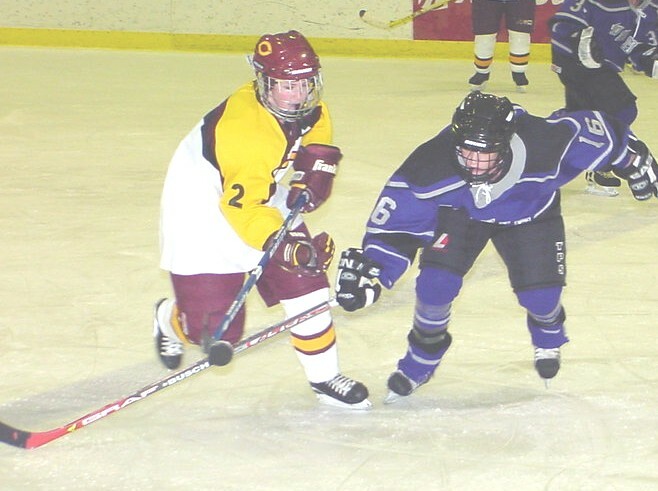 11/06 Concordia Women's Hockey Preview for 2003-04 is Now Online. Lindsay Kurtis will be looking to break the school's all-time scoring record in 2003-04. For Kerry Norman and the rest of the Concordia women�s hockey team, it will be a season of letting go of the past and looking towards the future. Like every successful team, or family, there comes a time when you have to struggle past the growing pains in order to reach a higher level. The Cobbers will find themselves having to replace three key players that acted as older siblings throughout the beginning of the women�s program at Concordia. Gone are all-time scoring leader Katie Jacques, record-setting goaltender Shyla Wilson and defensive mainstay Sandra Rydén. In their place are a bunch of honed veterans and young players trying to show that they have what it takes to make Concordia a consistent, top three finisher in the MIAC. In the past two seasons, Concordia has finished as high as second place, played in two consecutive MIAC tournaments and set school records in wins in both years. To continue to flourish in the ever-improving MIAC, the team will have to rely on the little sisters that have been content to sit by and watch through the good times. 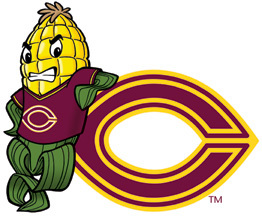 The talent level will be present for the Cobbers in 2003-04 but the key will be to find success in the early season and then avoid a lull in the dog days of February. Returning to take the seats at the head of the table for Concordia are senior wing Lindsay Kurtis, junior center Lindsay Czarnecki and back-up goaltender Jamie Savage. Kurtis has already tallied 116 points in her first three seasons as a Cobber. She is on track to break Jacques� school record of 138 career points. However, she will have to learn how to play without Jacques, her scoring Siamese twin, who took most of the defensive pressure from the opposing teams and was able to free up valuable space in front of the goal. After Kurtis, the team will have to replace three of its next top five leading scorers. Returning for her sophomore season will be all-conference forward Bridgette Richter. Richter was seventh in the MIAC in scoring last year and finished third on the team in overall points. Norman will more than likely pair Kurtis and Richter on one line, which will leave Lindsay Czarnecki to captain the second line and provide a balanced scoring attack. Czarnecki had a breakout season in 2002-03. She was named to the MIAC All-Conference Honorable Mention Team and finished the year by scoring three goals in the last three games. After Kurtis, Richter and Czarnecki there is no other player on the current roster that has scored more than 10 points in a season. The infants of the team will be asked to more than just crawl around during the 2003-04 season. Touted as the diaper dandies of the crew are Brandi Dunn of Plano, Tex. and Hannah Impola of Brainerd, Minn.
On defense, the Cobbers have the biggest set of hand-me-downs to fill. Gone is the sometimes-spectacular Rydén who was a mainstay with the team for the past five years. Her defensive partner Jenei Estrada is also missing from the opening day roster, however, she might make a return to the team after Christmas break. Her absence at the beginning of the year will leave matriarch Norman with only three defensemen with significant playing experience. Sophomores Kali Palmer and Samantha Gunning are the two most experienced returning blueliners. Both had solid first years and will be looking to take a big step forward in 2002-03. Junior Charity Hartzell will be counted on to add depth and experience. Like the forwards, the defense should have a pair of baby boomers. Marya Losinski of Cold Spring, Minn. and Ashley Mazur of Woodland Hills, Calif. will have to hit the ice flying if Concordia will have a chance to continue at the level they have been accustomed to in the past two years. On paper, the goaltending situation looks a lot more frightening than it actually is. Of all the top players that will be replaced, the one that had the most promising understudy was netmider Shyla Wilson. Junior Jamie Savage has been groomed to take over the two-time All-MIAC�s spot for the past year and a half. Last season Savage split the goaltending duties during the regular season and posted an impressive 2.42 goals against average and a .922 save percentage. Both numbers were better than those posted by Wilson. Savage was also a perfect 5-0 in games started last year and has a 6-1 mark over her first two seasons.